A 40-year-old prisoner has escaped from Lotus Glen Correctional Centre near Mareeba, late on Sunday night. Andrew John Palmer was serving a custodial sentence at a prison farm attached to the main correctional facility and was discovered missing around midnight. The offender is serving a four year sentence for attempted robbery and break and enter offences and was not due for release until August 2014. Palmer was sentenced in March and was last seen at a headcount at 8.50 pm Sunday and reported missing at 11.50 pm Sunday. The escapee was serving his sentence at the low security prison farm section of the complex. I don’t think he’ll be doing much farming once he’s rounded up. 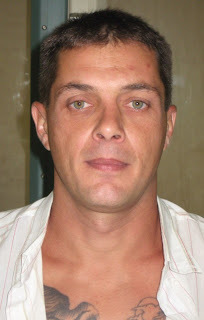 He's described as 179 cm, 80 kg, medium complexion, green eyes and clean-shaven with short brown hair. He also has numerous tattoos including the grim reaper and a Harley flag on his left arm; a sleeve from shoulder to elbow on his right arm; a wizard and mermaid on his chest; demons on his back and feathers on his right leg.